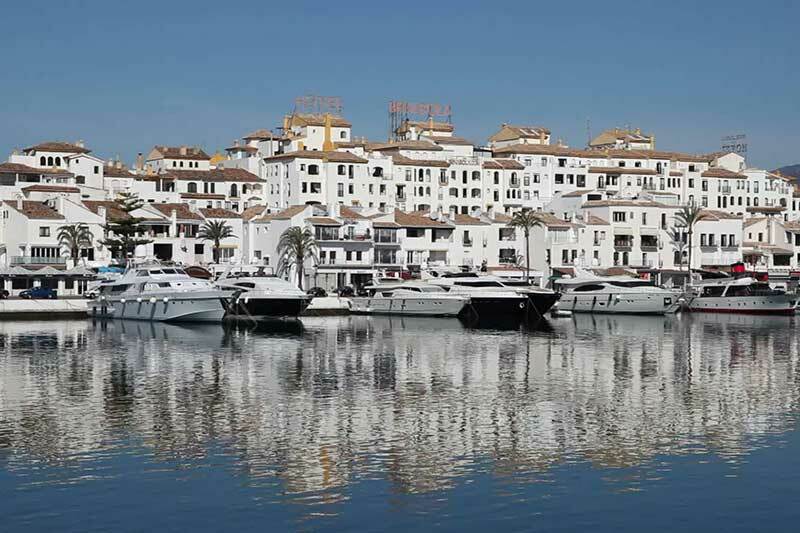 Puerto Jose Banus, commonly referred to as Puerto Banus is located in the Nueva Andalucia area just a few minutes’ drive south west of Marbella. For many years Puerto Banus has been famous for attracting celebrities from all over the world, therefore attracting many curious visitors to do some celebrity spotting. There is more to Puerto Banus than just the marina, even though this is the main focal point, the area known as Puerto Banus has numerous designer shops, restaurants, banks, supermarkets and all the amenities any tourist or resident would require. The port was inaugurated in 1970 which made Jose Banus the largest property developer in the Costa del Sol, the inauguration was attended by many famous people such as Aga Kahn, Roman Polanski, Prince Rainier and Princess Grace of Monaco, Hugh Heffner and Dr Christiaan Barnard (Pioneer of heart transplant). A young Julio Iglesias sang for the guests, reportedly having been paid 125,000 pesetas (750 Euros) to do so. This lavish affair included 22kg of Beluga caviar served by 300 waiters from Seville. The original plan by Jose Banus who was a close friend of Francisco Franco was to build skyscrapers to house wealthy families, however, having been persuaded by the Noldi Schreck (participant in designing and construction of Beverly Hills)not to do so as the area would lend itself far better for a sophisticated Andalucian village with marina. His advice proved to be correct as Puerto Banus receives some 5 million visitors per year making it the number one entertainment centre on the Costa del Sol. Puerto Banus lies in what is known as golf valley, surrounded by numerous famous golf courses such as Alhoa Golf, La Quinta Golf, Los Naranjos Golf, Marbella Golf and Country club just to name a few. There are a number of prominent statues in Puerto Banus, one of them is The Rhinoceros by Salvador Dali. This 3.6 tonne statue was places in Puerto Banus in 2004, it is known as El Rinoceronte en Puntillas, the Rhinoceros in Lace, it was created by him after a surrealist film he did in 1956. Another famous landmark in Puerto Banus is the bronze and copper statue near the port which stands at 26 metres of height. “La Victoria” as it is known was created a by Georgian sculptor by the name of Zurab Tsereteli and was unveiled by the mayor of Moscow as a gift in 1994.